Happy October and Happy Birthday to me! Needless to say October is my favorite time of year, not because it’s the month of my birth year but because of Halloween and fall. 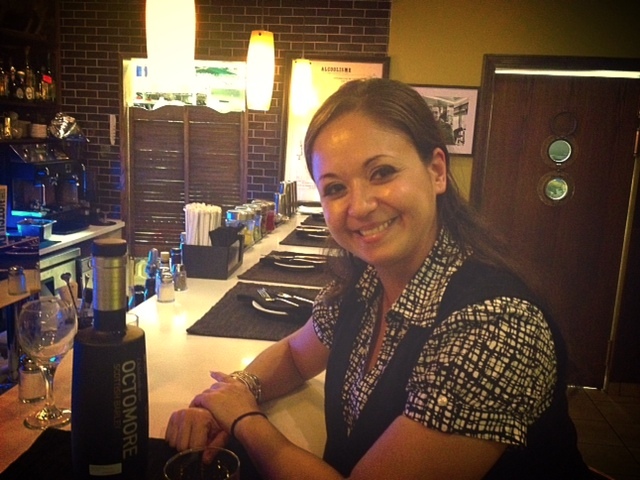 Friday night while having dinner with my great friend Melissa, I spotted a bottle of Octomore on the bar shelf. I immediately knew I would treat myself to a dram since the name was extremely fitting for my first October blog post. In the end Melissa picked up the tab so thank you my friend for the great treat. Octomore by Bruichladdich is not named after the month of October however; it is actually named after James Brown’s Farm, Octomore Farm above Port Charlotte in Islay. Octomore Farms is the source for the Scottish barley used. Yes this whisky is only 5 years old, it is very young but it is so very good. I can only imagine the potential of this whisky in about 10 or more years. If it tastes fastatic now, the words amazing would probably be used if aged for longer. If you like sweet whiskies, this is not the whisky for you. If you don’t like peat, then please stay away because this is also not for you. 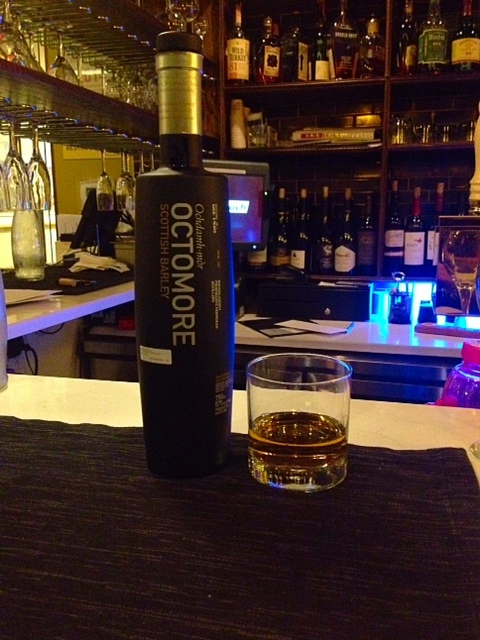 Octomore isn’t just peated, it is heavily peated and you not only get that on the smell, but also on taste. This whisky is a campfire party in your mouth. Finish: Like I said before, a campfire in our mouth that was extremely smooth. It leaves you all warm and happy inside. I absolutely loved this whisky. I want Bruidhladdich to age this whisky for longer. I think they will have an absolutely amazing product on their hands if they did. In all the places I checked, this bottle was about $200 and also sold out. If you happen to come across it then I think you should try it if you love peat smoke. It is a must try and yes worth it even though it’s extremely expensive. The upside you don’t have to buy the bottle, you can always try out at a bar if they have it.